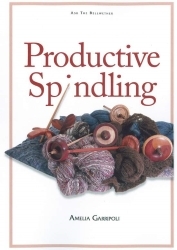 Productive Spindling explores spindle spinning in the 21st century! Learn top whorl, bottom whorl and Turkish spindle methods and amp up your techniques for efficiency – with tricks that make productivity fun! Over 120 photos and drawings on 52 pages. Spindlers will find many useful tips for all kinds of fiber, on spindle choice, drafting, joins, plying and finishing. Productive Spindling is packed with photos to show technique, spindles, yarn, and finished items by the author and the worldwide spindling community. 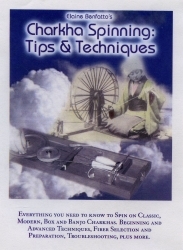 Elaine Benfatto demonstrates the tips and tricks of charkha spinning on this DVD from Copper Moose (about 75 minutes). She uses her own Bosworth Book Charkha (as well as several other charkha types) in this program. Elaine is well known for her charkha spinning and workshops. Eileen Hallman’s much-loved Charkha 101 and 201 classes are now available on DVD. This tutorial features 90 minutes of Eileen’s clear, concise and easy to follow instruction for spinning on the book-size charkha. Eileen, director of New World Textiles, is a well known instructor for charkha spinning workshops.